By Michelle Zive, M.S., R.D. Hello, my name is Michelle and I’m an emotional eater. In 2007, my oldest daughter asked me to go with her to a group weight-loss program. She’d gained weight over her senior year of high school, and she wanted to lose the extra pounds. Why Do We Eat in Times of Emotional Distress? Thousands of years ago, our bodies were programmed to consume lots of food because we didn’t know when or where the next meal would come from. We feasted during the summer, spring and fall months and starved during the winter. Deep in the recesses of our brains, we still have this mentality of feast and famine even though we live in a world where we are surrounded by countless opportunities to eat lots of calories. In addition to the historic connection, there also is a physiological context to stressful eating (American Council on Exercise, 2011). When we are emotional, the hypothalamus triggers the anterior pituitary to release adrenocorticotrophic hormone (ACTH) into the blood. This hormone travels to the adrenal cortex, where cortisol is purged into the bloodstream. Cortisol is the stress hormone that causes an increase in blood sugar, suppresses the immune system and assists in the metabolism of fat, protein and carbohydrate. It also is largely responsible for what is commonly known as the fight-or-flight mechanism. Our ancestors lived in an environment where this stress mechanism saved lives by filling their bodies with hormones and sugar to either fight danger or run from it. However, once the body has responds to the stressful situation, it craves sugar and carbohydrates to recharge this system. Today, we live in a stressful society where we are constantly bombarded with these stress hormones and the subsequent cravings of sugar to recharge. Historically and physiologically, we are hardwired to eat when stressed (or sad, bored, angry, etc.). Emotional eating can be defined as eating in response to negative emotions (Van Strien et al., 1986) and is directly linked to binge eating (Arnow et al., 1995). This was how I was “coping” with the fact that Molly was going off to college. Instead of acknowledging my sadness, I was stuffing my face with bean-and-cheese burritos. In addition to the cortisol-induced cravings and stress, there are other common triggers to binge eating such as social eating, childhood habits, mindless eating, self-sabotaging thoughts and the cycle of hunger and restriction. Practice mindfulness. Tracking food and beverage intake should help your client become more mindful of his or her coping behaviors (e.g., overeating) and emotions (Alberts et al., 2010; Dalen et al., 2010). There are, however, additional ways to practice mindfulness, such as eliminating distractions and taking the time to chew or drink and really taste the food (Albers et al., 2011). Convince your client to turn off the television during mealtimes by explaining that eating while distracted can quickly sabotage even the most carefully constructed food plans. The same can be said for social situations. If there is noise, good cheer and other people eating, it can be easy to lose track of the amount of food being consumed. On the other hand, it can be even more detrimental if the client is emotionally eating while he or she is alone. Recognize the feeling of hunger. When we are eating our emotions, it doesn’t matter if we are hungry or not. Teach your clients to understand the difference between physical and emotional hunger. Have your client practice what Michelle May, M.D., author of Eat What You Love, Love What You Eat, calls the 10-second cure for stress eating. Have the client think of his or her stomach as a gas tank and to try to measure how full or empty it is. Assign a 1 for feeling starved and a 10 for being overfull. The goal is to eat when the stomach feels about a 4—somewhat hungry, but not starving, which might cause one to overindulge. Your clients may find themselves asking this question all day long. That’s okay. We really don’t check in enough to our physical hunger, but over time, this hunger self-check will become second nature. I encourage my clients to say these things out loud or write these thoughts down, because it makes them more mindful of what they’re telling themselves. Next, I’ll ask, “Would you talk to your best friend like this?” The answer is always an emphatic “no,” which leads directly into my next question: “Then why do you talk to yourself this way?” Teach your clients to talk and accept themselves as if they were their best friend or even their child. 1. Out of sight, out of mind. 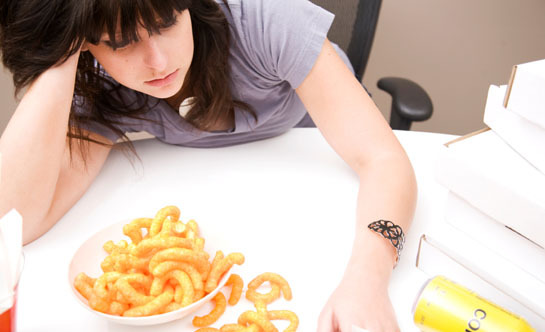 Have the client alter his or her home, office and car environments so that binge-trigger foods are not close at hand. 2. Build a good nutritional foundation. Have you heard of the 80:20 rule? Eating well most of the time will make the client feel less stressed when he or she overindulges on occasion. 3. Have a Plan B…and C and D, if necessary. Some clients plan and write down what they are going to eat tomorrow. Why? When there’s a plan, and a back-up plan, there is a greater tendency to stay on track. Mind over matter is the name of the game when practicing these skills. When we’re in an emotional state we have a tendency to blow things out of proportion, make them personal and lose perspective. Then we have an excuse to eat the whole gallon of ice cream. Help your clients to shift out of their negative responses by using positive self-talk. Give your clients examples of ways to recharge, such as exercise (of course), taking a walk with a friend, meditating, finding a change of scenery or taking a mental break, and getting a good night’s sleep. These actions will help build the foundation needed to resist the temptation to emotionally eat. Albers, S. (2011). 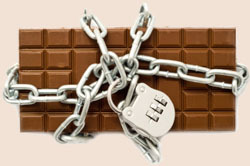 Using mindful eating to treat food restriction: A case study. Eating Disorders, 19, 97–107. Alberts, H.J.E.M. et al. (2010). Coping with food cravings: Investigating the potential of a mindfulness-based intervention. Appetite, 55, 160–163. Alberts, H.J.E.M. et al. (2012). Dealing with problematic eating behavior: The effects of mindfulness-based intervention on eating behavior, food cravings, dichotomous thinking and body image concern. Appetite, 58, 847–851. American Council on Exercise (2011). ACE Lifestyle & Weight Management Coach Manual (2nd ed). (Eds Bryant, C.X. and Green, D.). San Diego, Calif.: American Council on Exercise. Arnow, B. et al. (1995). The emotional eating scale: The development of a measure to assess coping with a negative affect by eating. International Journal of Eating Disorders, 18, 79–90. Dalen, J. et al. (2010). Pilot study: Mindful Eating and Living (MEAL): Weight, eating behavior and psychological outcomes associated with mindfulness-based intervention for people with obesity. Complementary Therapies in Medicine, 18, 260–264. Groesz, L.M. et al. (2012). What’s eating you? Stress and the drive to eat. Appetite, 58, 2, 717–721. Van Strien, T. et al. (1986). The Dutch Eating Behavior Questionnaire (DEBQ) for assessment of restrained, emotional and external eating behavior. International Journal of Eating Disorders, 5, 747–755. Michelle Murphy Zive, M.S., R.D. has worked in community and nutrition research for the past 20 years at the University of California, San Diego, in the Division of Community Health. She's published more than 50 peer-reviewed articles on determinants of healthy eating and physical activity, as well as the impact of environment on health. Zive is the co-author, with Dr. Philip Nader, of You Can Prevent Childhood Obesity: Practical Ideas From Infancy to Adolescence, A Legacy of Health for Our Children. For more information on this book, go to www.youcanloseyourbabyfat.org. Could Leafy Greens Be the Perfect Pre-workout Snack? Your Grandmother … the Athlete? Your grandmother probably isn’t cut out for pull-ups and sports-conditioning drills, so why would you want her trainer to incorporate those movements into her workout plan? Explore the pros and cons of the popular fitness trend of “training your grandmother like you train athletes,” and learn how you can help all your clients avoid injury. Search easier at ACEfitness.org/ConEd thanks to a new streamlined continuing education section of our website. Find the courses, bundles and workshops you want faster with categorized navigation and the ability to target CEC value. Buy now and you can get 10% off.